Welcome to InuYasha Fanfiction. This is a fanfiction site for Inu Yasha fans. Check out our Site Updates to see what is new! Please support our site by clicking on our sponsors at the bottom. Sesshoumaru's mokomokosama (that furry thing on his shoulder)... people think it's a tail or a something else. What do you think it is? A demon parasite that he can store some of his power? A boa as a fashion statement? Just an extension of himself that he can add his power to? Looking to raise $500 by June 25, 2019, to keep the site open for another year. Click HERE to find out how to donate! 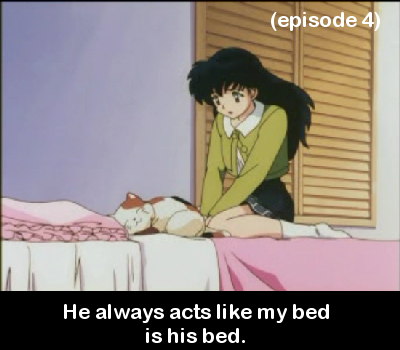 Kagome is abandonded by her father and gets adopted by neighboring college boys.